A WHO reports. Mexico, USA, and Canada are shown as a breakdown of the total. Roughly 10% of Canadians had been infected with the virus as of mid-late November with 416 confirmed deaths as of January 7; there were over 10,000 confirmed cases when Health Canada stopped counting in July 2009. Canada began its vaccination campaign in October and 40% of the populace has since been immunized against H1N1. The widespread effect of H1N1 in Canada were a concern for the XXI Olympic Winter Games, which took place in Vancouver on February 2010. Dr. José Ángel Córdova Villalobos, Mexico's Secretariat of Health, stated that since March 2009, there have been over 1,995 suspected cases and 149 deaths, with 20 confirmed to be linked to a new swine influenza strain of Influenza A virus subtype H1N1. As of April 26 there had been 1,614 cases, with 103 deaths and about 400 patients in hospital; approximately two-thirds of the sick patients had recovered. "'As many as 23,000 Mexicans were likely infected with the swine flu virus,' Neil Ferguson of Imperial College London and colleagues reported in the journal Science." 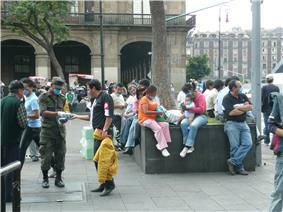 Soldiers mobilized by the government have handed out six million surgical masks to citizens in and around Mexico City. On April 24, 2009, schools (from pre-school to university level) as well as libraries, museums, concerts and any public gathering place, were shut down by the government in Mexico City and the neighboring State of Mexico to prevent the disease from spreading further; the schools in Mexico City, the State of Mexico, and the state of San Luis Potosí will remain closed until at least May 5. Marcelo Ebrard, Mexico City's mayor, has also asked all night-life operators to shut down their places of business for ten days to prevent further infections. José Ángel Córdova, federal Secretary of Health, said on April 24 that schools will probably be suspended for at least the following week then, and that it will take around ten days to see the evolution of the virus' behavior, and to consider other measures after such. On April 25, President Felipe Calderón declared an emergency which granted him the power to suspend public events and order quarantines. Hours later, Córdova announced that classes in Mexico City would be officially suspended through May 6. On April 26, Natividad González Parás, governor of the northeastern State of Nuevo León, announced that state-wide schools will remain closed until 6 May, and established a quarantine system in airports, central bus stations and the creation of observation points mainly in the southern part of the state at the nearest highways to the borders with other states, in order to realize tests conducted on people arriving from other states. However, as for April 27, there are no confirmed reported cases of infection in this state. On April 26, the World Bank announced US$ 25 million in immediate aid loans to Mexico, an additional US$ 180 million for long-term assistance to address the outbreak, and advice on how other nations have responded to similar crises. On April 27, the Secretariat of Public Education announced that all schools in Mexico will remain closed at least until May 6. On April 28, the Mexico City government closed all restaurants and cinemas. The National History and Anthropology Institute also closed all its archaeological sites and museums, including the most famous Mayan and Aztec ruins, until further notice. Initial reports of atypical flu in two individuals in southern California led to the discovery of the novel swine flu virus by the CDC in mid-April. More than a hundred cases were confirmed in the next two weeks, spread through a dozen states. Outside of California and Texas, initial cases were all tied to recent travel to Mexico or close contact with those who had recently visited Mexico. St. Francis Preparatory School, a private school in New York, was the center of a large cluster of cases after a Spring Break trip by several students, and perforce one of the first U.S. schools to be closed as a public health measure during the early outbreak. Most of the cases in California and Texas are not linked and may reflect localized outbreaks of this virus in those areas. As of April 30, the disease was not as virulent outside of Mexico as within Mexico, for reasons not fully understood. The United States of America declared a state of Public Health Emergency but this was said to be standard procedure in cases as divergent as the recent inauguration and flooding. According to The New York Times, "the emergency declaration frees resources to be used toward diagnosing or preventing additional cases and releases money for more antiviral drugs," including the transfer of approximately 12 million influenza medications from a federal stockpile to states. The U.S. plans followed a guidebook developed over the past five years to fight a pandemic flu such as H5N1. The situation developed rapidly with the White House initially looking into the matter on April 24 according to press releases, but rapidly adopting a serious stance as the WHO and CDC issued stronger recommendations. On April 29, the US suffered its first confirmed death of swine flu. On April 28, the Centers for Disease Control and Prevention had officially confirmed through tests that a 23-month old child was infected with the flu. When the sickness continued to worsen the next day, he was transferred to Texas Children's Hospital in Houston, where he died. On May 5, Judy Trunnell, a woman in her 30's suffering from "chronic underlying health conditions" died of swine flu in Cameron County, near the US-Mexico border. She was the first US citizen to die from the disease. The woman, a special education teacher, had recently given birth to an eight-month-term healthy baby, delivered by caesarian section. She had been in a coma after being admitted to the hospital with breathing problems on April 19. The woman had also suffered from asthma, rheumatoid arthritis and a skin condition. On May 10, a 30-year-old man with underlying health problems died in Washington from H1N1, the first fatality in that state. On May 17, 55-year old Mitchell Wiener, an assistant principal at Intermediate School 238 in Hollis, Queens died from H1N1, making it the first H1N1 related fatality in the state of New York. Wiener suffered from many other underlying health problems, weakening his resistance to the disease. On May 19, 2009, a St. Louis County man became the first death in Missouri due to the Swine Flu. As of mid-May 2009 many states had abandoned testing for likely influenza cases unless serious illness and/or hospitalization were present. Because reported numbers represent only confirmed cases, they are a "very great understatement" of the total number of cases of infection, according to the CDC. The real number of swine flu cases in the United States could be “upwards of 100,000,” a top public health official estimated on Friday — far higher than the official count of 7,415 cases confirmed by laboratories. On September 1, 2009, several new virus isolates were tested for neuraminidase inhibitor resistance. These included one seasonal influenza A (H1N1), 13 influenza A (H3N2), 23 Influenza B, and 1, 855 2009 influenza A (H1n1) virus isolates. Trevor van Gellecum, the Director of the Aruban Department of Health, announced that all passengers arriving by airplane or cruise ship will have to fill out a health questionnaire beginning on April 27, 2009. Hotels and resorts are required to report to authorities if any tourists are showing flu-like symptoms. The government of Aruba also ordered antiviral medication and other supplies from the Netherlands and the United States. No swine flu cases have been reported. Ten students and teachers who arrived from Mexico in the last week of April are in quarantine. The Minister Of Health, Donville Inniss has confirmed that two samples have been sent off to the Caribbean Epidemiology Centre (CAREC) in Trinidad and Tobago to be tested for the virus. There are two suspected cases of swine flu currently under investigation in Belize. As a result, all major public events have been cancelled. This includes the National Agriculture and Trade Show. People have been asked to be very careful and use preventative measures. A 21-year-old woman was confirmed as carrying the swine flu virus on April 28. The woman came back from Mexico by airplane. A second case was confirmed on the same day, a 30-year old man who traveled to Mexico the week before. On May 2 the Costa Rican Ministry of Health confirmed two more cases. Four more cases were confirmed on May 4. A 53 year-old man became the first confirmed death from the disease in the country, as reported by the Minister of Health on May 9. This was the first death outside of a North American country and the fourth country in the world to present a mortal case. The deceased man was suffering other chronic diseases. The Minister of Health informed he had diabetes and also was suffering from chronic obstructive pulmonary disease (COPD). She also informed the man was infected inside Costa Rica because he had not traveled to Mexico. As of September 8 the Costa Rican Ministry of Health had 1,246 confirmed cases, 1,257 pending cases, 6,337 already discarded, and 33 deaths. The mortality rate is 0.73 deaths by 100,000 people, and the fatality rate is 2.96%. From all deceased patients, 48.5% occurred among San José residents, and only the Guanacaste Province has not had any deaths related to the virus. The age of the deceased varies between 20 to 79 year-old, with an average age of 41 years. Cuba's Health Ministry is adopting precautionary measures to prevent the illness from coming into the country. The government has advised citizens to go to seek medical treatment if experiencing flu-like symptoms. Cuba has also banned flights to and from Mexico for 48 hours. The ministry statement said that in all of Cuba, authorities have tested 84 possible cases in people of eight nationalities for the virus. Only one case was positive - the Mexican student. ^ "Situation updates - Influenza A(H1N1)". Epidemic and Pandemic Alert and Response. ^ Alphonso, Caroline (2009-11-25). "Severe allergic reaction seen after H1N1 flu shot". "Roughly 10 per cent of Canadians have been infected, and another 25 per cent have been immunized." 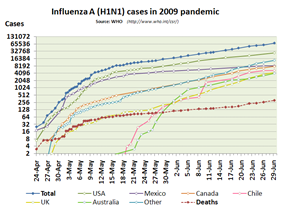 ^ "Bi-weekly and cumulative number of deaths due to Pandemic (H1N1) 2009, by province/territory, Canada". Public Health Agency of Canada. 2010-01-07. Archived from the original on 13 January 2010. Retrieved 2010-01-07. ^ "H1N1 'not done yet':Canada's top doctor". ^ "Mexico closes schools nationwide due to swine flu". Associated Press. Archived from the original on 29 April 2009. Retrieved 7 June 2009. ^ "Influenza-Like Illness in the United States and Mexico". ^ "Reuters AlertNet - Swine flu death toll in Mexico rises to 103". Alertnet. Archived from the original on 29 April 2009. Retrieved 2009-04-27. ^ a b c Neergaard, Lauran (2009-04-26). "World govts race to contain swine flu outbreak". Associated Press. Retrieved 2009-04-26. ^ "AP Top News at 9:11 p.m. EDT". Associated Press. 2009-04-25. Retrieved 2009-04-25. ^ "Pide Ebrard parar 10 días vida nocturna". Reforma. 2009-04-25. ^ "Estima SSA 10 dias de alerta por influenza". El Universal. 2009-04-25. Archived from the original on 28 April 2009. Retrieved 7 June 2009. ^ "Mexico’s Calderon Declares Emergency Amid Swine Flu Outbreak". Bloomberg L.P. 2009-04-25. Archived from the original on 27 April 2009. Retrieved 7 June 2009. ^ "Se suspenden clases hasta el 6 de mayo" (in Spanish). Excélsior. 2009-04-25. Archived from the original on 29 April 2009. Retrieved 7 June 2009. ^ "Nuevo Leon schools to be closed down until 6 May" (in Spanish). El Universal. 2009-04-26. Archived from the original on 9 June 2009. Retrieved 7 June 2009. ^ "All schools closed in Mexico". CNN. 2009-04-27. Retrieved 7 June 2009. ^ "Human Swine Influenza Investigation". ^ "Mayor Says City Confirms 20 More Cases Of Swine Flu". ^ Thomas H. Maugh II (April 24, 2009). "Eight swine flu cases identified in U.S.: All victims, six of them in California, have recovered. Officials say the new virus is easily passed, but does not appear to be especially virulent. Researchers plan to go to Mexico, where the viruses in 12 cases match six in the U.S.". ^ "US Declares Public Health Emergency for Swine Flu". The New York Times. Associated Press. Retrieved 7 June 2009. ^ Healy Jack, Stolberg, Sheryl Gay (April 26, 2009). "U.S. declares public health emergency over swine flu". ^ "Brownsville Hospital Officials speak out". Valleycentral.com. Archived from the original on 3 May 2009. Retrieved 2009-05-02. ^ "US resident dies from swine flu". BBC. 2009-05-05. Archived from the original on 9 May 2009. Retrieved 7 June 2009. ^ a b "Flu suspected in US teacher's death". Smh.com.au. 2009-04-23. Archived from the original on 8 May 2009. Retrieved 2009-05-08. ^ "Homem no Estado de Washington morre por conta da nova gripe". O Globo. 2009-05-10. Retrieved 7 June 2009. ^ Yaniv, Oren; Kennedy, Helen (2009-05-17). "Assistant principal Mitchell Wiener dies from complications of swine flu". ^ "Demand, flu patterns lead states to reduce testing". University of Minnesota. 8 May 2009. Archived from the original on 31 May 2009. Retrieved 7 June 2009. ^ Emma Hitt, PhD (9 May 2009). """CDC: H1N1 Flu Numbers Represent a "Very Great Underestimate. Archived from the original on 15 May 2009. Retrieved 7 June 2009. With limited resources, some states are placing a priority on testing hospitalized patients, which may create a false impression that the virus is becoming more lethal, Richard Besser, MD, the CDC's acting director, said at a media briefing yesterday. However, he added that scaled-back testing is also in line with how public health officials handle testing for seasonal influenza. Given that the swine flu outbreak seems to resemble seasonal flu, expect the CDC to revise some of its recommendations and change some of its reporting practices, he said. As the disease becomes more widespread, tallies of individual cases won't be as meaningful, but health authorities will want to know what regions of the country are affected and to what extent, Besser said. For reporting on the swine flu outbreak, the CDC will likely use the surveillance and reporting model it uses for seasonal flu. Minnesota is among states that have announced a cutback in influenza testing. In a May 4 press release, the Minnesota Department of Health (MDH) said it was asking healthcare providers to submit lab specimens only when a patient has been hospitalized for flu-like like symptoms. It will also continue to accept specimens from the state's 29 sentinel influenza surveillance sites and for ill healthcare workers. May 9, 2009 — The confirmed numbers of influenza A (H1N1) cases reported are likely to fall far short of the actual numbers occurring within the community, according to a US Centers for Disease Control and Prevention (CDC) spokesperson. "The individual numbers are likely a very great underestimate of how much virus is circulating or how many people are becoming ill from it," said Anne Schuchat, MD, the Director of the CDC's National Center for Immunization and Respiratory Diseases, speaking at a media briefing today. ^ Donald G. McNeill Jr. (15 May 2009). "Mild U.S. Flu Cases May Exceed Official Tally". ^ a b c d "Aruba checks disembarking passengers: Precautionary measures regarding swine influenza". Amigoe. 2009-04-27. Retrieved 2009-04-29. ^ a b "Suspected swine flu cases in Caribbean as WHO raises alert level". Caribbean360.com. 2009-04-30. Archived from the original on 3 May 2009. Retrieved 7 June 2009. ^ "Confirmada primera tica con fiebre porcina" (in Spanish). ^ "Salud reporta dos nuevos casos de gripe porcina en el país" (in Spanish). ^ "Sube a ocho cifra de ticos infectados con gripe pandémica" (in Spanish). ^ "Gripe porcina: Costa Rica confirmó la muerte de un hombre a causa de la enfermedad" (in Spanish). ^ a b c Ministerio de Salud de Costa Rica (2009-09-08). "Comunicado Oficial: Situación de la Influenza Pandémica en Costa Rica al 8 de setiembre de 2009 - Boletín N. 56" (in Spanish). Archived from the original on 2009-09-16. Retrieved 2009-09-12. ^ "Latin American countries adopt preventive measures against swine flu". China View. 2009-04-28. Archived from the original on 1 May 2009. Retrieved 2009-04-29. ^ "Cuba suspends Mexico flights because of swine flu". ^ "Cuba confirms first case of swine flu". ^ "Two cases confirmed in the Dominican Republic". DiarioLibre.com. 2009-05-27. Archived from the original on 30 May 2009. Retrieved 7 June 2009. ^ "9 more swine flu cases in Dominican Republic". MLive.com. 2009-05-31. Retrieved 2009-05-31. ^ "Pregnant girl dies with AH1N1 flu". ^ a b "Guatemala tests patient for suspected swine flu". Reuters. 2009-04-29. Archived from the original on 30 April 2009. Retrieved 2009-04-30. ^ "Ministro de Salud confirma primer caso de AH1N1 en Guatemala | elPeriódico de Guatemala". Elperiodico.com.gt. Retrieved 2012-06-13. ^ "Jamaica Prepares for Swine Flu". Jamaica Bserver. April 29, 2009. Archived from the original on 2 May 2009. Retrieved 2009-04-30. ^ Agile Telecom Ltd. and Xidemia. "Young Warriors take Flu tests(April 29)". ^ "$4.4M lotto winner jailed". The Star (Toronto). 2009-07-22. Archived from the original on 2009-09-10. Retrieved 2009-08-13. 17 March First case in the world of what would later be identified as swine flu. 28 March First case in the US of what would later be identified as swine flu. 12 April First known death due to what would later be identified as swine flu. 25 April Community outbreaks confirmed in United States. Community outbreaks confirmed in Mexico. 27 April First case confirmed in Canada. 29 April First death confirmed in the United States. 2 May First case confirmed in Costa Rica. 3 May First cases confirmed of infections in pigs, also first cases of reverse zoonosis. 4 May First case confirmed in El Salvador. 5 May First case confirmed in Guatemala. 7 May First death confirmed in Canada. 8 May First case confirmed in Panama. 9 May First death confirmed in Costa Rica. 12 May First case confirmed in Cuba. 13 May Community outbreaks confirmed in Costa Rica. 22 May First case confirmed in Honduras. 26 May First case confirmed in Puerto Rico. 27 May First case confirmed in Dominican Republic. 31 May First case confirmed in Bahamas. 2 June First case confirmed in Nicaragua. First case confirmed in Bermuda. 3 June First case confirmed in Barbados. First case confirmed in Jamaica. 4 June First case confirmed in Trinidad and Tobago. 5 June First death confirmed in Dominican Republic. First case confirmed in Cayman Islands. 7 June First case confirmed in Martinique. 8 June First case confirmed in Dominica. 10 June First death confirmed in Guatemala. Community outbreaks confirmed in Guatemala. 11 June First case confirmed in British Virgin Islands. 17 June First case confirmed in U.S. Virgin Islands. First case confirmed in Netherlands Antilles. 19 June First case confirmed in Antigua and Barbuda. 22 June First death confirmed in Honduras. 30 June First case confirmed in Saint Lucia. 2 July First case confirmed in Saint Vincent and the Grenadines. 3 July First case confirmed in Aruba. First death confirmed in El Salvador. 6 July First case confirmed in Guadeloupe. First case confirmed in Saint Martin. First death confirmed in Jamaica. 7 July First death confirmed in Puerto Rico. First case confirmed in Belize. 9 July Community outbreaks confirmed in Panama. 14 July First case confirmed in Haiti. First case confirmed in Saint Kitts and Nevis. 19 July First death confirmed in Panama. 22 July First case of Oseltamivir (Tamiflu) resistance found in Canada. 23 July First case confirmed in Turks and Caicos Islands. 24 July First case confirmed in Grenada. First death confirmed in Cayman Islands. 25 July Community outbreaks confirmed in El Salvador. Community outbreaks confirmed in Nicaragua. 26 July Community outbreaks confirmed in Cuba. Community outbreaks confirmed in Honduras. 27 July First death confirmed in Saint Kitts and Nevis. 5 August First case confirmed in Anguilla. 12 August First death confirmed in Nicaragua. 14 August First case of Oseltamivir (Tamiflu) resistance found in United States. 3 September First death confirmed in U.S. Virgin Islands. 18 September First death confirmed in Martinique. 19 September First death confirmed in Bahamas. 30 September First death confirmed in Barbados. 1 October First case confirmed in Saint Barthélemy. 10 October First death confirmed in Cuba. 14 October First death confirmed in Trinidad & Tobago. 22 October First death confirmed in Guadeloupe. 11 November First case confirmed in Greenland. The members of the Under 17 Trinidad and Tobago football team have taken Flu tests after returning from a World Cup qualifying football match in Mexico City. One female was confirmed as having contracted the H1N1 influenza. Her identity is being withheld. At the moment, people who travelled on the same aircraft as the infected woman are being asked to contact the relevant health authorities. 66% of the cases are teens (12–15) and the 34% are adults(20-49). Only one death haas been reported. Schools with positive cases are being disinfected and thermographic cameras have been deployed at Tocumen International Airport to identify sickness in arriving passengers. As of 7 July 2009, there has been 33 confirmed cases of swine flu in Jamaica. On the 6th of July, Jamaica recorded its first human mortality from the virus. Health Minister Ruddy Spencer told Parliament that the country has been placed on high alert. There has been heightened surveillance at health care facilities and port entry's. Honduras reported its first confirmed case of swine flu(H1N1) on 27 May 2009. On 22 June it reported its first death of swine flu. The government has stated that they're prepared for a first wave of AH1N1. Nevertheless, other institutions have started to help population by giving them masks and information about the virus. University of San Carlos de Guatemala by the Faculty of Farmacy and Pharmaceutics has started to prevent the virus among the students population, as the Rector Estuardo Gálvez said: "This people are prepared to counteratack the virus inside and outside this campus". On the same press meeting, Rafael Espada said: "We've to prepare ourselves for the worst, and just hope for the best". On May 5, in a meeting with Health Minister and the Vicepresident, it was announced that an 11-year-old girl was infected with the AH1N1 virus. It was told that the family of the girl came from Mexico a few days ago, but no one else in the family it is infected. Guatemala is checking all travelers arriving from Mexico for signs of flu and stopping anyone with symptoms of the virus at border crossings. A 29-year-old, who had recently visited Mexico, was being tested for a suspected case of swine flu. On June 5, a 17-year-old pregnant girl infected with the AH1N1 virus died. 44 cases where confirmed to this date.